Now you can have an 8 Volt charging system to upgrade your factory 6 Volt system. This will provide you with better starts, brighter lights, and better ignition performance. Use our alternator in conjunction with Interstate's 8 Volt battery (part # 1-8V-VHD) and your all done. No need to replace any other components. 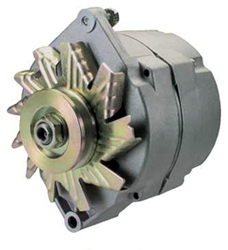 Our 8V alternator will produce up to 70 amp and will keep charging even at idle. Also see our conversion brackets to upgrade from an original generator.